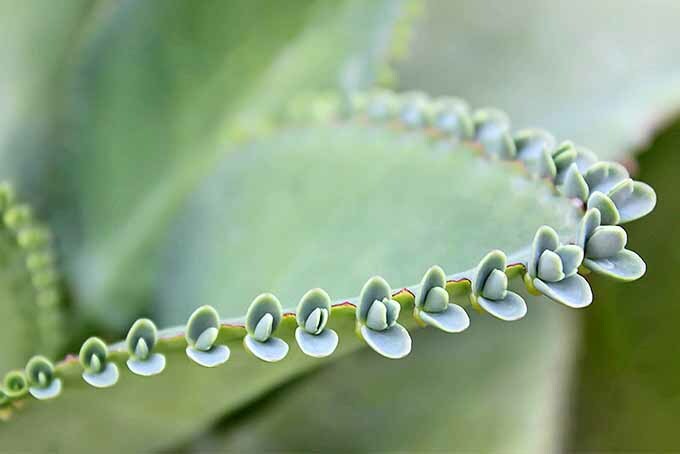 The succulent is one of nature’s most efficient plants, and one of the easiest to propagate. 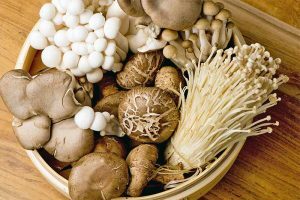 It’s a type of “xerophyte,” a shallow-rooted wonder that thrives in dry climates and stores water in fat, fleshy leaves and stems. 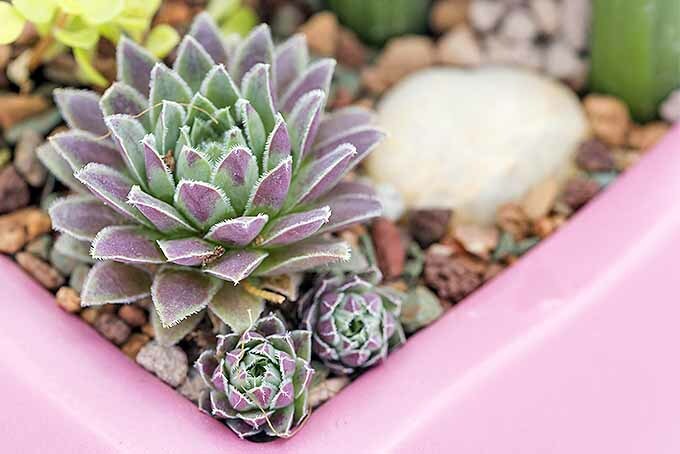 Succulents come in an extensive variety of textures, colors, shapes, and sizes. 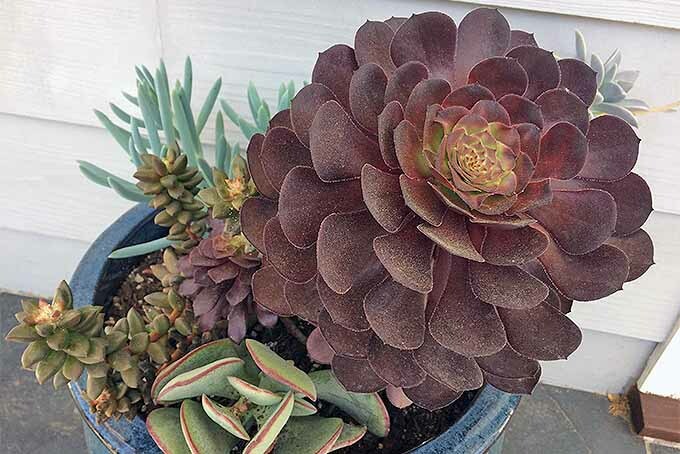 From the smooth blue rosettes of echeveria hugging the soil in compact clusters, to the towering 6-foot agave Americana stretching toward the summer sun, they comprise one of the most fascinating plant species. 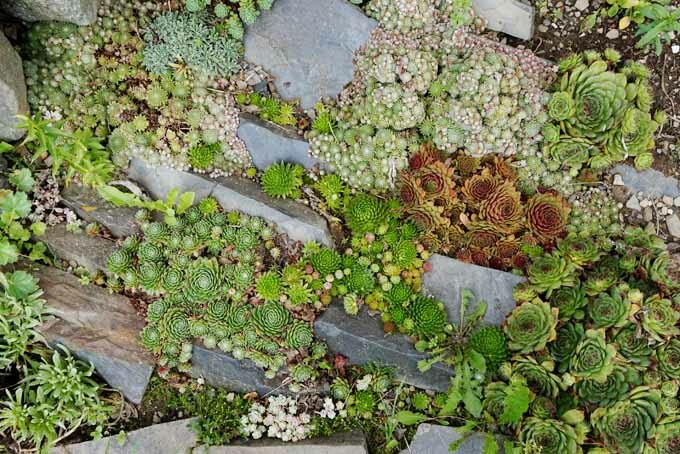 Succulents grow outdoors in temperate climates, and make excellent additions to xeriscapes, where irrigation is minimal. They’re at home between pavers, in rock gardens, and peeking out from crevices in stone walls. 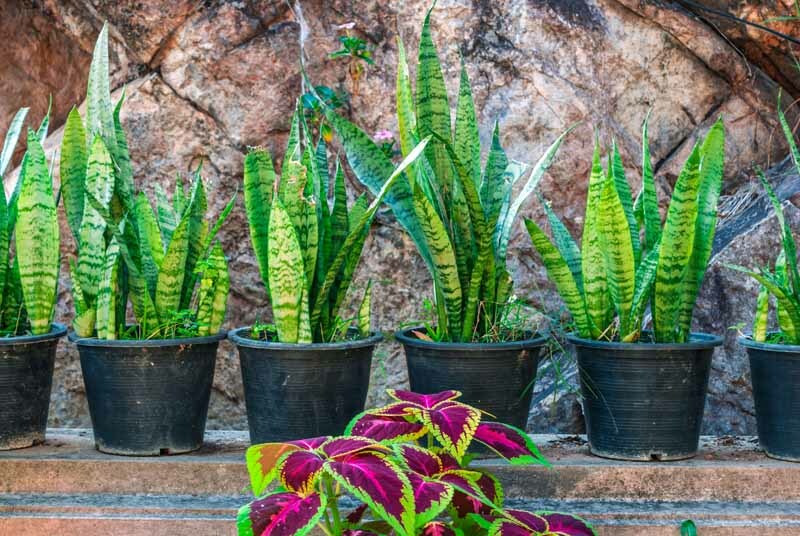 These versatile plants also thrive indoors in pots with good drainage, as well as in terrariums, provided they are watered sparingly. My favorites are miniature varieties. I like to plant them in interesting containers, grouped to create an eclectic desertscape. 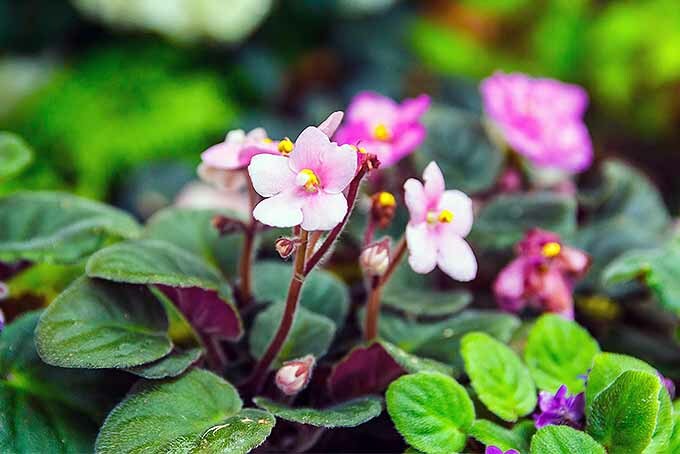 You’re going to fall in love with these low-maintenance beauties, and knowing how to propagate them means you can grow as many as your heart desires. 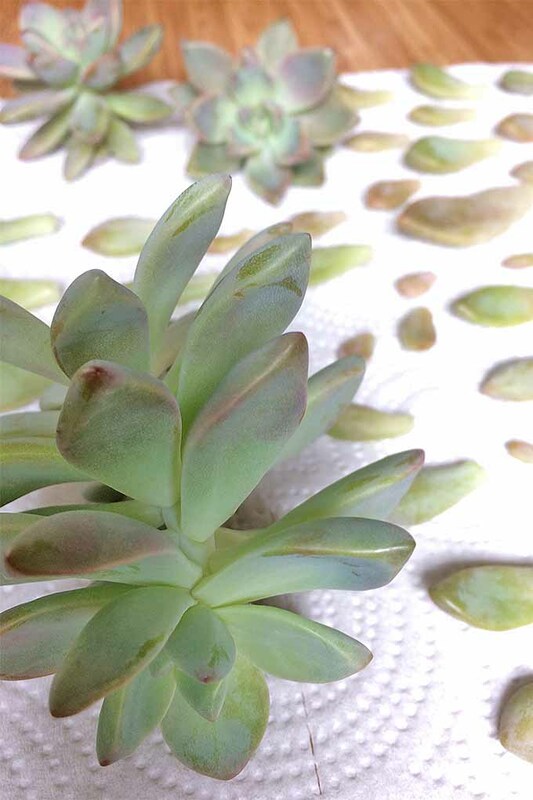 Succulent plant propagation is a breeze. Of course, you may start from seeds, but it’s easier and faster to use the plants you have to produce even more. You may divide a plant in two ways. 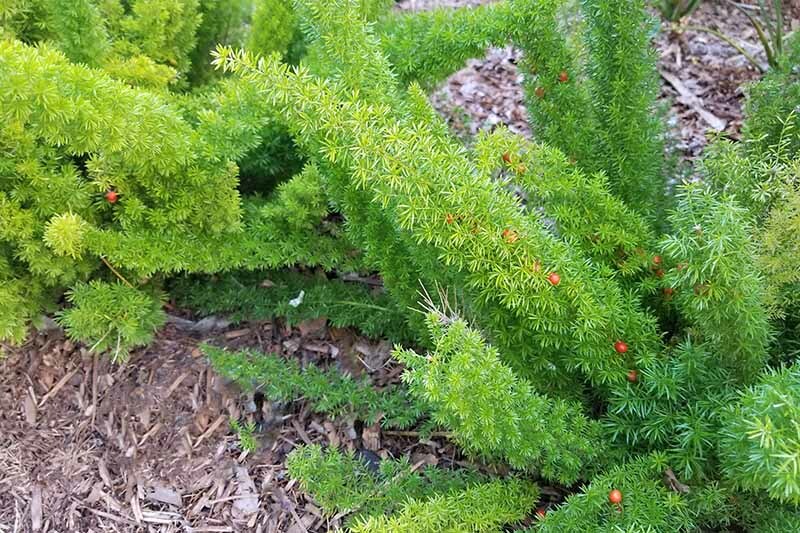 Remove plantlets, or offsets, that have sprung up alongside the mother plant. 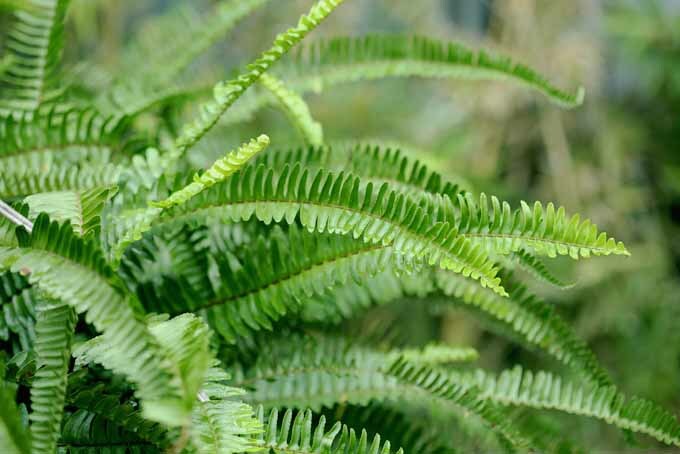 These are fully-formed and rooted mini-plants that can grow independently. 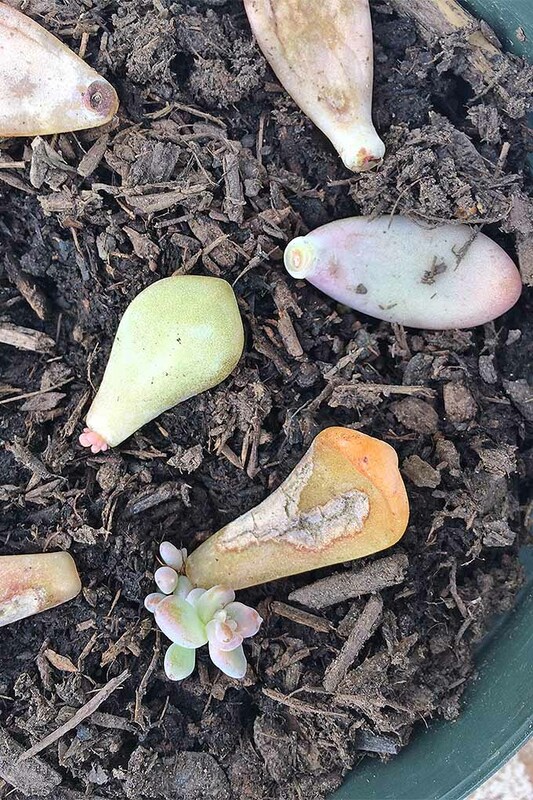 Some succulents drop plantlets. Like seeds, they take root where they fall. Unearth an entire plant and gently tease the roots apart. Plant the separated clumps individually. Plants that have been divided by root separation may be placed in soil immediately. 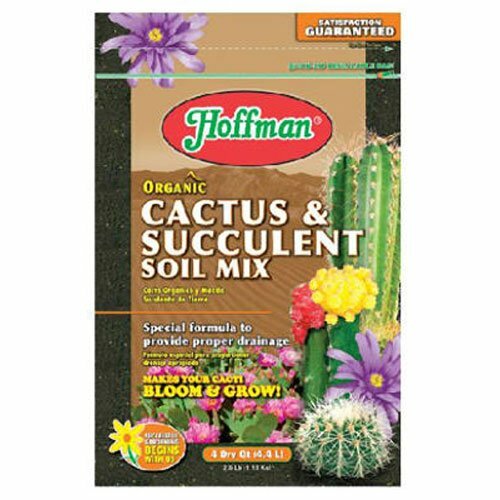 For indoor plants, use a potting medium recommended for cactus and succulent plants, like Hoffman Organic Cactus and Succulent Soil Mix. You can also mix a handful of sand or perlite into potting soil. The proper mix promotes drainage and provides nutrients. Wait a day, then water sparingly. 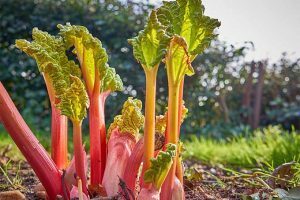 Return outdoor plants to the garden when the sun is not directly overhead. Work the soil until it is crumbly, mound it up a bit, and make a shallow depression with room for sprawling roots. 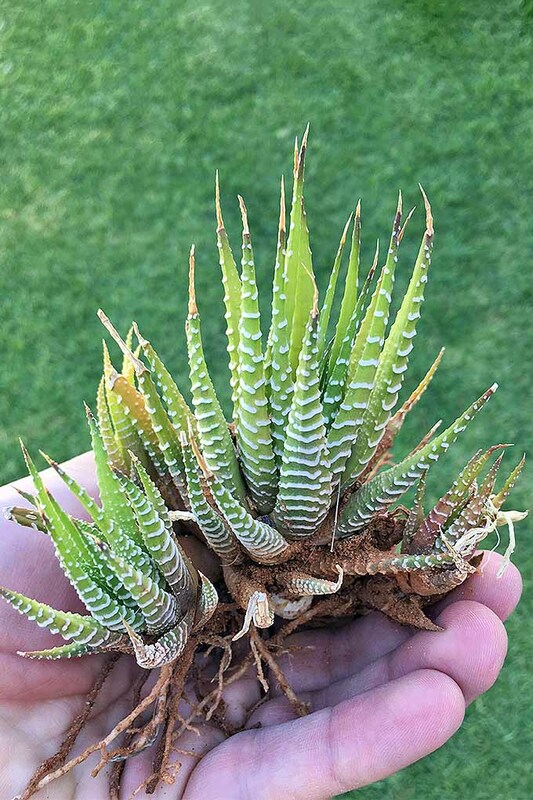 A zebra cactus, or Haworthia, with exposed roots. 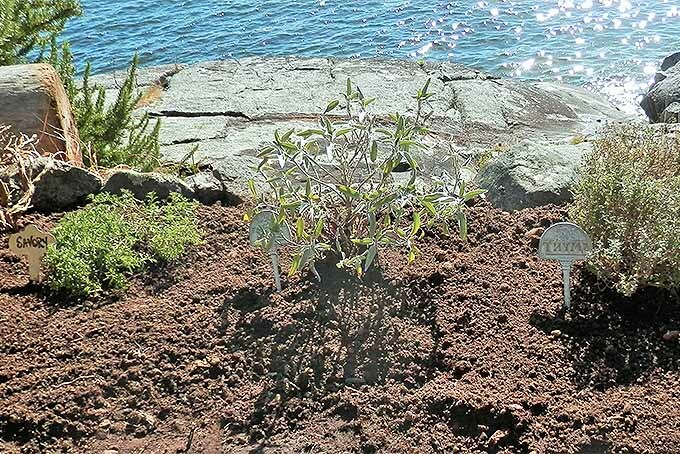 Nestle your plant carefully into it and gently cover the roots with about an inch of soil. Tamp gently to secure. Wait a day, and then lightly water the soil around the plant. With the cutting method, just cut off a piece of leaf or stem, let it dry, and you’ll have roots and shoots in no time. The trick is to keep it totally dry. 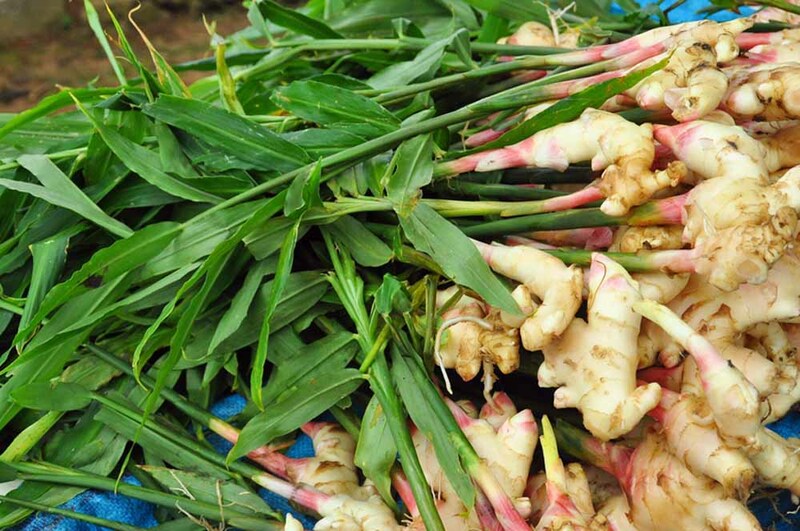 Randomly remove several leaves, dry them out, let them grow roots, and plant. 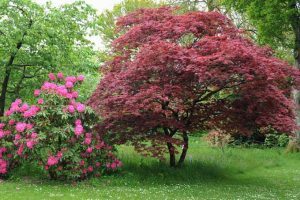 This is a good fix for a plant that has grown tall and spindly, or whose leggy bare limbs drape downward like a pendant. 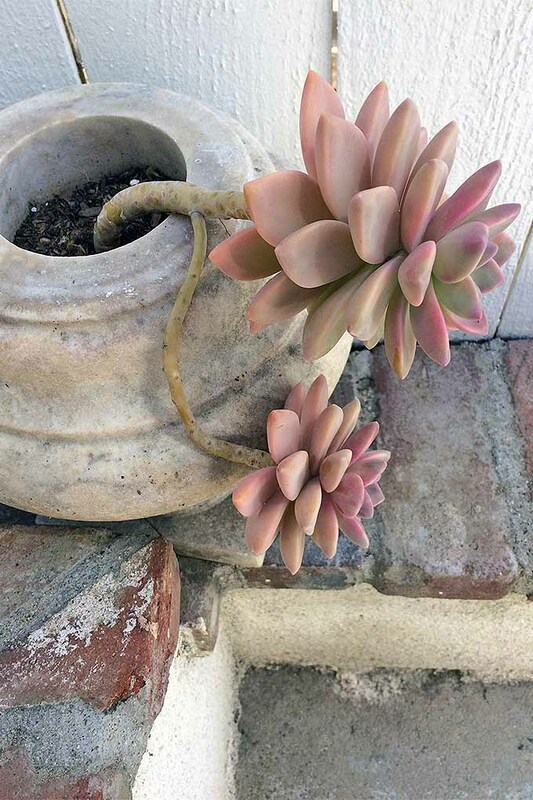 A gorgeous pink-hued succulent, from the front… Photo by Allison Sidhu. 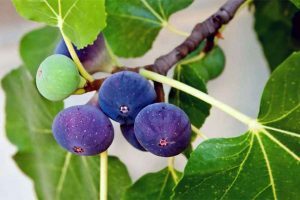 Simply cut the head of the plant off the lengthy stem, leaving about an inch of stem attached. Dry it out, let it grow roots, and plant. 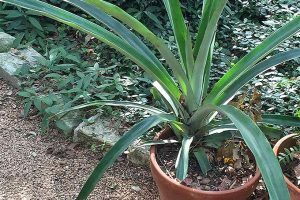 The remaining stem of a healthy beheaded plant should grow new leaves in a compact grouping, making for a sturdier, more attractive plant. From the side, you can see this plant has grown very leggy. Photo by Allison Sidhu. 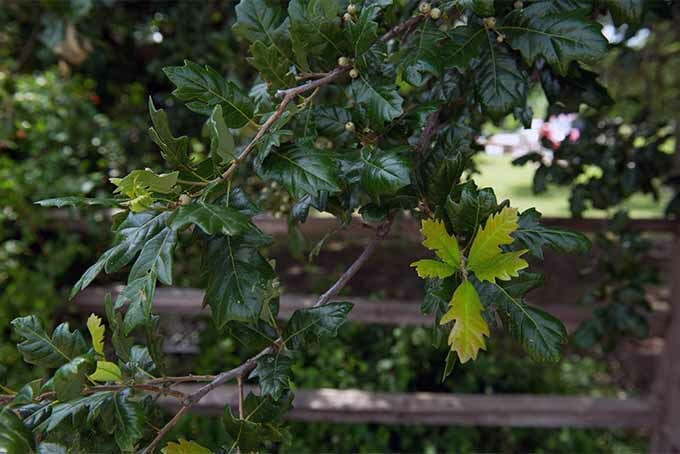 As indicated, cuttings made from leaves and plant heads must dry out and grow roots before planting. 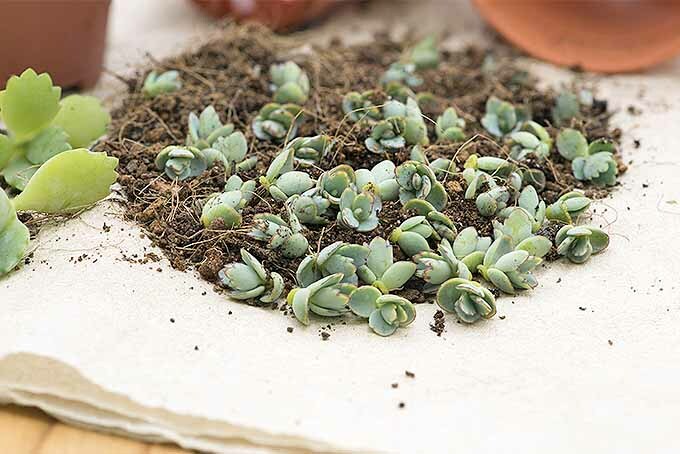 Randomly remove a few leaves from your succulent plant, twisting gently to remove the entire leaf without tearing. On leggy growth, these can be removed from the bottom portion of the stem, which will be discarded. Cutting back leggy succulents to make room for new growth. Photo by Allison Sidhu. For plants like Christmas cactus, you may need to use scissors to remove an individual leaf. 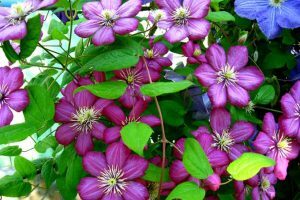 If you are “beheading,” use your scissors or clippers to cleanly cut the stem about an inch below the lower leaves of the plant head. Set the cuttings aside in any type of container or tray. They’re not fussy. No potting medium or water are needed. Check them in about five days and see if each has formed a callus on the cut end. This protects the exposed soft tissue from bacterial penetration. Watch for the growth of roots over the next few weeks. After callusing off, roots begin to emerge. Photo by Allison Sidhu. Leaf cuttings will begin to wither as they become food for emerging new plants. 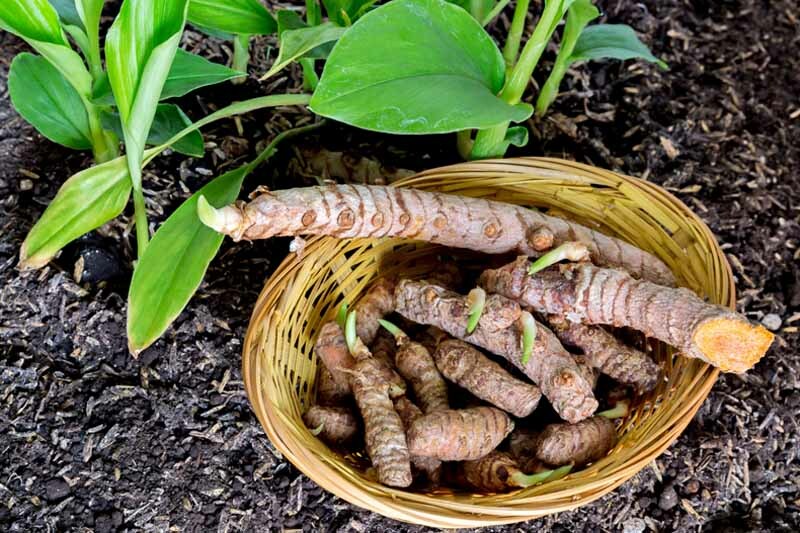 When roots form, fill well-draining containers of your choice with potting medium, or select a garden location suitable for planting. You can also opt to mix a handful of sand or perlite into regular potting soil. Baby succulents, starting to grow. Photo by Allison Sidhu. 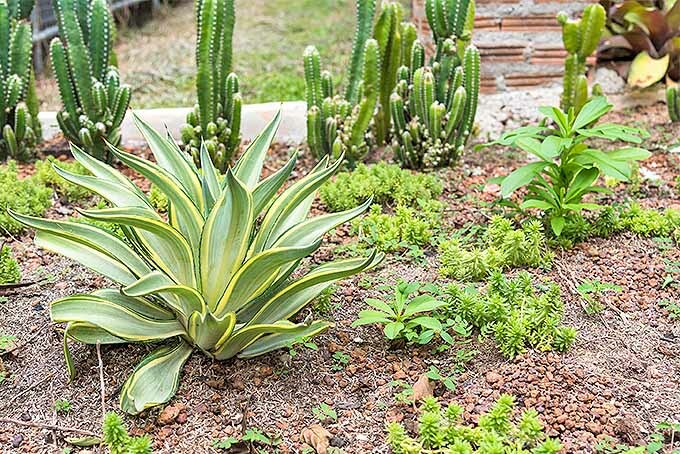 Succulents thrive in sunshine and well-drained soil. Without sun, they grow pale, and with too much water, they rot. Plant in a sunny spot in early morning or late afternoon, when the sun is less intense. A desert garden, with succulents and cacti. Mound soil up to raise the cuttings above the edge of your container, or garden surface. Gently tamp the soil down to secure the roots, and do not water. Embellish with decorative stones or pebbles as desired. The next day, water sparingly and gently tamp the soil down again. As your new plants acclimate to their surroundings, growth will accelerate. At this point, it’s time to purchase a succulent/cactus food, like Miracle-Gro Succulent Plant Food, available on Amazon.com. Administer per manufacturer’s instructions. 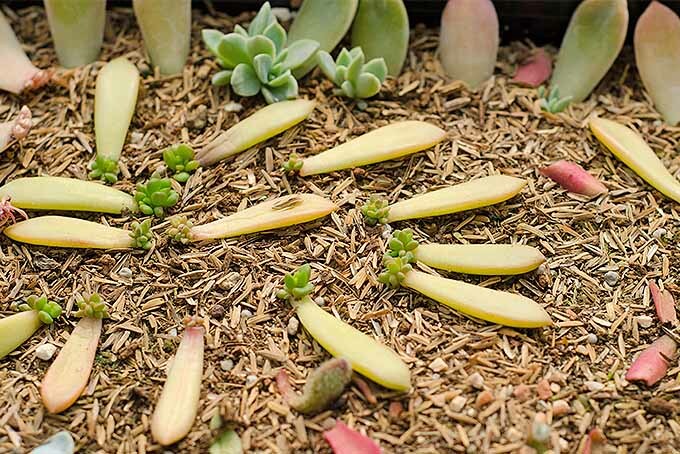 There are other techniques for propagating succulents, including placing cuttings on top of potting medium to callus off, thus enabling them to root themselves directly into the soil. 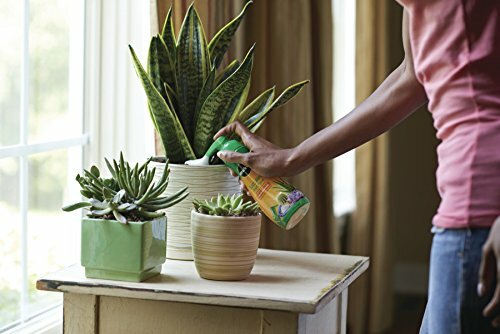 Miracle-Gro Succulent Plant Food, 8 Oz. 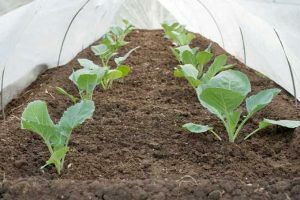 This method is great if you want to start your own potting nursery for many cuttings at once, however, you must keep the soil completely dry while the cuttings callus off and form roots. 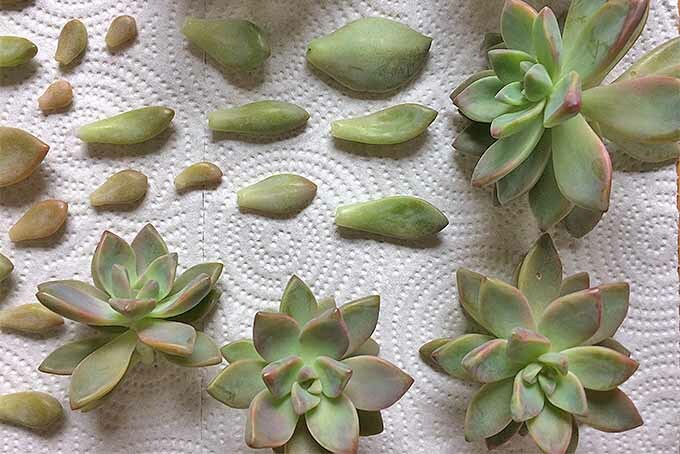 Plan to spend a few weeks on the propagation process, trying various methods and noting results. A gardening journal is great for record-keeping. 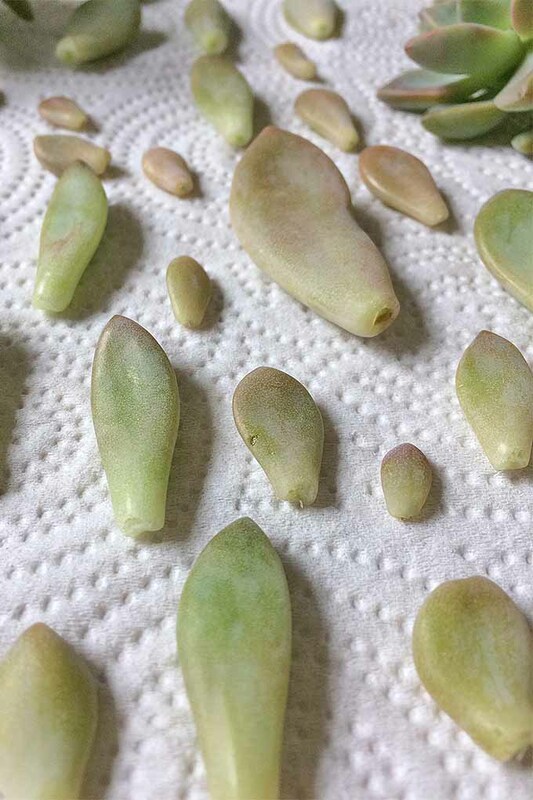 Propagating succulents is easy and fun. From a plantlet, division, leaf cutting, or beheading, you can increase your collection of these beauties. 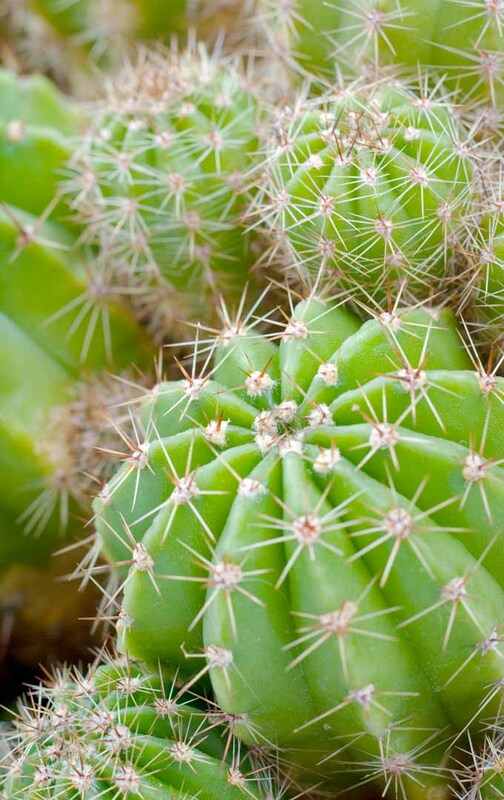 By now you may be curious about types of cactus we haven’t mentioned. We know this: barrel types form pups that may be harvested and planted individually. And, Christmas cacti have individual leaves that may be cut, callused, and rooted. But what about others, like column varieties? Since the entire cactus is one giant leaf, the question is, where do we cut? Simply cut into the top or side of a columnar cactus and remove a piece about an inch in diameter. Place it on a dry surface that won’t be disturbed and forget it for a few months. 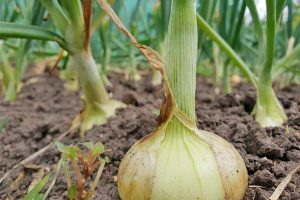 During this time, provided it remains dry, the cutting will callus off and form roots. Then it’s ready to plant. 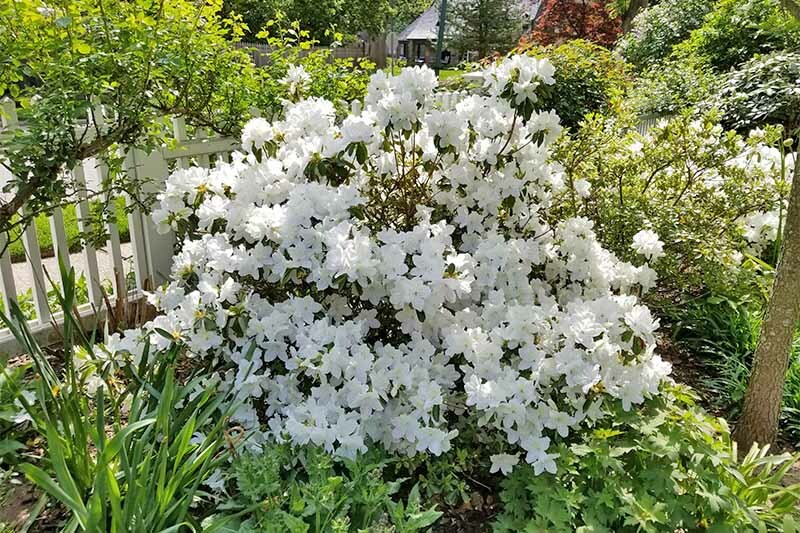 They make a spectacular display when planted in multi-variety groups, forming a tapestry of living colors, shapes, and sizes that remind me of a deep-sea coral reef. 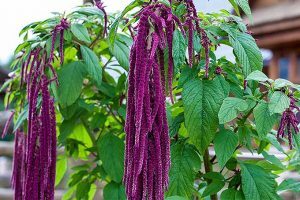 So hardy and vibrant, it’s hard to believe that they grasp the soil with roots that are barely threads, and require scarcely a thimbleful of water to thrive. Heed the need for little moisture and water sparingly! 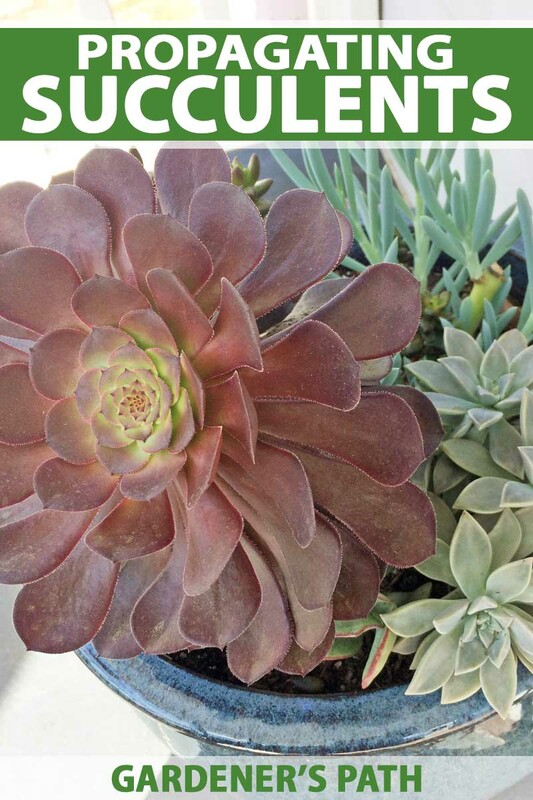 This tip from succulent devotees is helpful: plant rosette-type varieties like echeveria angled downward. This way, water runs out instead of accumulating and promoting rotting. 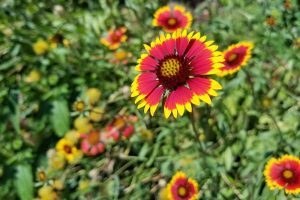 It’s time to spruce up your décor with nature’s desert wonders and enjoy what may be the simplest and most rewarding type of gardening you’ve ever tried. 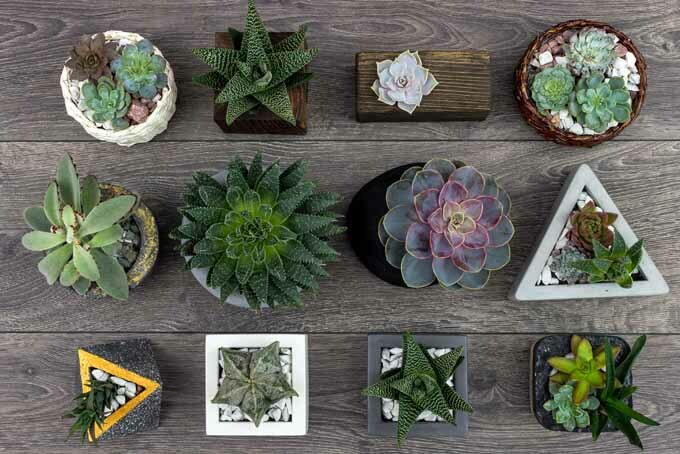 Visit a local nursery and choose succulents that appeal to you. Nurture them and try your hand at growing new plants to share with friends. And use the techniques described above to propagate these unique plants like a pro. 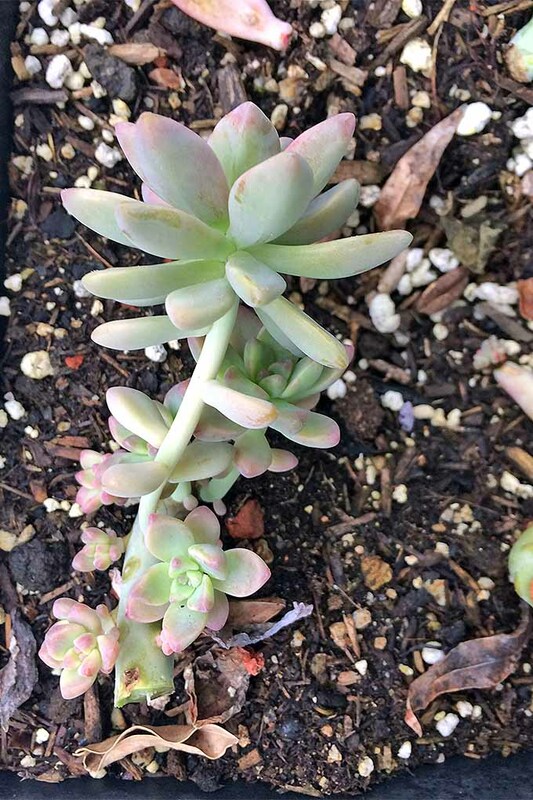 Do you have a favorite succulent? 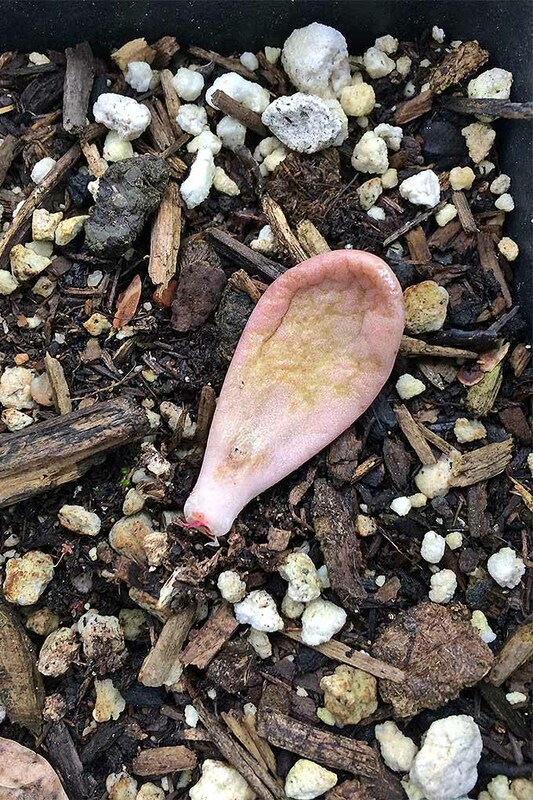 What plant propagation tips would you like to share? We’d love to know your thoughts in the comments section below. Photos by Allison Sidhu, © Ask the Experts, LLC. ALL RIGHTS RESERVED. See our TOS for more details. Uncredited photos: Shutterstock. I have beheaded a few of my leggy plants and after a couple of days the stems on them have gotten shrivelled and limp rather than calloused. Is this normal? Are they still okay to use? I have some small vine-like succulents. Do I leave them on the top of the soil? Have they developed roots, Joyce? 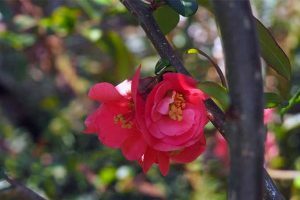 Propagating the vining species can be more difficult, but not impossible. If you can be more specific about what the species might be, we may be able to provide some additional info to help you out. So, my family and I had no idea how it works but we ended up using the method of taking the plantlets but they are growing really tall, leggy, I think. Please help. Leggy growth is an indication that they need more light. 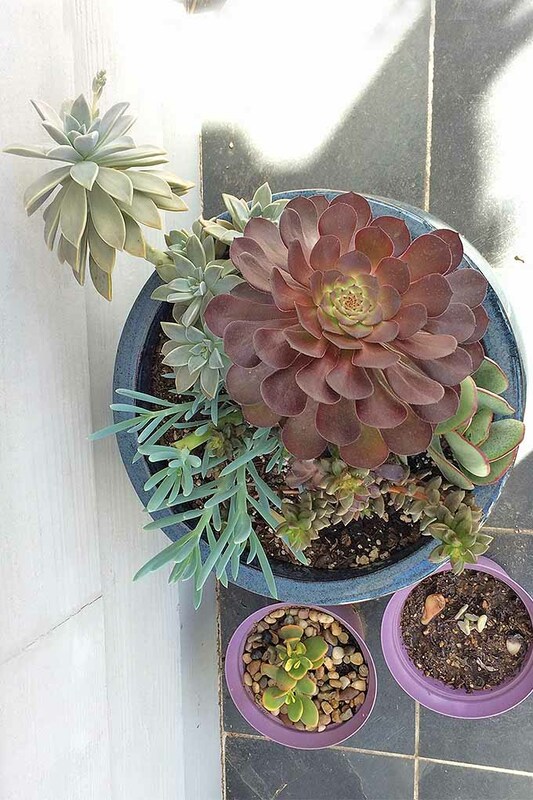 To start, try moving them to a sunny location, and remember that potted starts need to be watered more frequently than established succulents typically will. 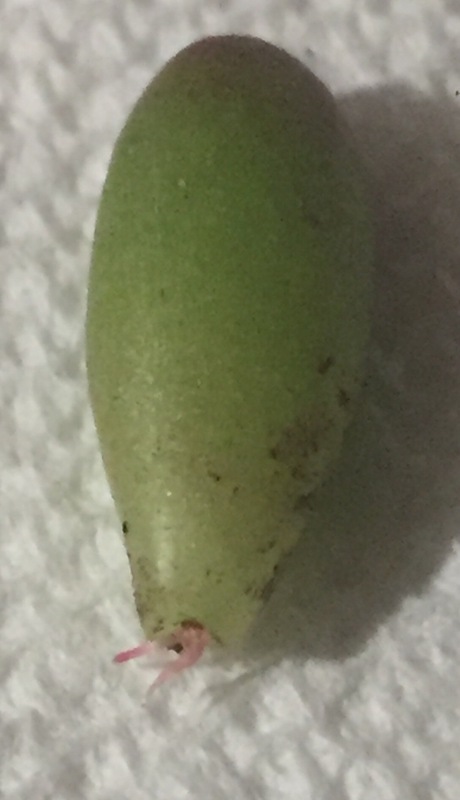 Hi, when planting the newly propagated cuttings, do you bury the mother leaf it has grown from or what do you do with the mother leaf? Since the mother leaf contains moisture, it will continue to nourish the new growth. You can either leave it on top of the soil and allow it to dry and fall off naturally, or bury it lightly. 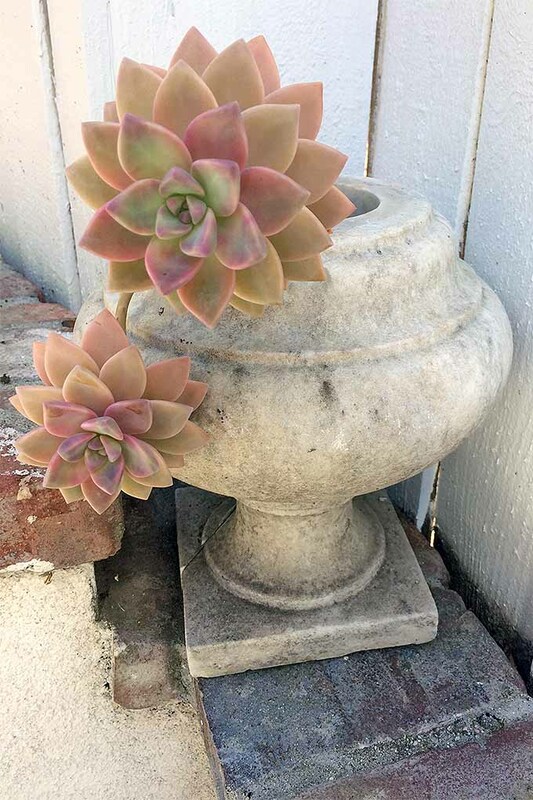 Our succulents seem to LOVE rusted out containers. I can hardly contain them. This is what I have so far. Is this ready for potting? Grace Hx, were you trying to post a photo? If so, I don’t see one. Yes. What should i do next? Hi Grace Hx you’ll want to hit the little camera button to the lower right and then three boxes will appear. Click on one and you can upload a photo and can upload three at a time. They are limited to 6 MBs each which are larger than most phone cameras produce on standard settings. I’ve attached a screenshot for you to see. You might want to reply up at the top so the photo doesn’t squeeze in these nested comments. Yes. The leaf has now 3 roots. What should i do next? Pls see the picture. This is my leaf. Grace Hx hmmm…not sure what’s going on with the photos (this is a new feature we just implemented). It uploaded ok. I’m going to attach it to my comment and then call on Allison Sidhu and Nan Schiller to answer your question as they are the resident succulent experts. This looks great Grace- you’ve callused off, and roots have grown. 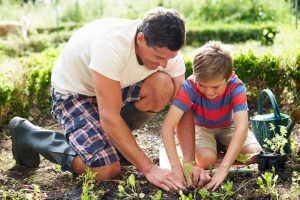 Scroll down to step 4 of our article- you’re ready for planting! 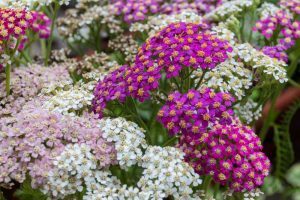 Either set on top of or lightly cover with a loose layer of succulent planting medium in a well-draining container, and place in a sunny location. 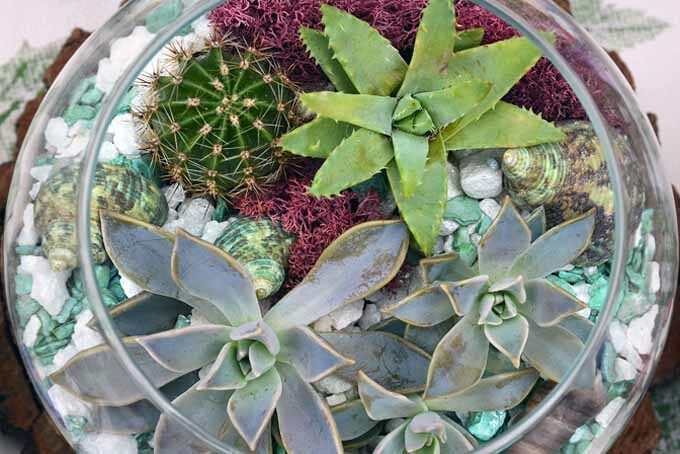 If you want to make your own well-draining soil that’s good for succulents, you can combine sand or perlite with regular potting soil.